Profitez d'un kayak ou promenez-vous sur la plage de la baie! Belle maison dans un excellent emplacement central. Grande chambre des maîtres avec lit king et un grand placard. Deux autres chambres partagent une salle de bain. Autre niveau séparé avec chambre et coin salon et chambre, grand canapé moelleux et causeuse ... Chambre et salle de bain au niveau inférieur également Peut être loué ensemble ou séparément, avec ou sans l'étage. Le salon à l'étage dispose d'une grande télévision connectée et d'un cercle de fauteuils pour que chacun puisse s'asseoir. Grande piscine et patio, piscine en plein soleil mais beaucoup d'ombre des arbres. plusieurs chaises longues et un ensemble de patio. Nous avons même des jouets flottants! La région est magnifique et proche de la baie. Nous avons un bateau et pouvons organiser une promenade au coucher du soleil ou une sortie de pêche. Ou peut-être faire un tour à Salt ou Greenport pour l'après-midi. Réservations de 2 semaines appréciées! First, know that the pictures shown are NOT of the house you will be renting. The house is clean enough, has a pool, etc but it isn't this house. Second, the house is fine for three or four bedrooms but is certainly not appropriate if you want more bedrooms. The 'bedrooms' downstairs are essentially a basement. if you have young kids (ages 5 to 20) it might work. Fortunately, we didn't need those bedrooms. Finally, do not expect to get your security deposit back. It has been six weeks and after several promises of action nothing has happened. Do yourself a favor and don't bother renting this place. We have a large family which gathers each year in the Hamptons to spend quality time together. We had accommodations at several properties this year and this home was one of them. The property was clean, well maintained, and perfect for the comings and goings of many family members. We enjoyed the pool as well as the short drive to the local beach. The town of Bridgehampton is very close for shopping and eating out. We were able to cater and cook meals as well with everyone relaxing and enjoying the many gathering spots on the property. We look forward to returning next year. We had trouble finding a home large enough with the right layout but this one worked really well for our recent retreat for a group of 24. It was as advertised and the manager was helpful and professional start to finish. I would recommend this property to anyone seeking a place for a large group. GREAT HAMPTON HOUSE, BEST POOL EVER! Love this wonderful place! My first stay was a family reunion and we had so much fun my sisters and I returned for a gal pal midweek getaway. 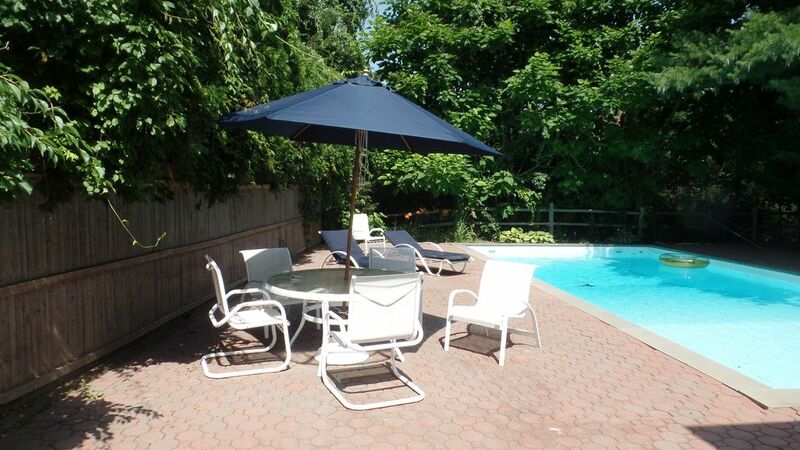 Big roomy house, amazing pool, We simply adore this rental for a little respite from urban insanity. It is very private and we had such a relaxing time just watching movies , having bbq's and lounging by the incredible all gunite pool. Booking was easy, host was a pleasure to work with both times. We will be back.